Most people are familiar with the sudden pain of a muscle cramp. The rapid, uncontrolled contraction, or spasm, happens unexpectedly. Sometimes it can happen during or following athletic activity or a workout. It can also happen with either no stimulation or some trivially small one. The muscle contraction and pain last for several minutes, and then slowly ease. 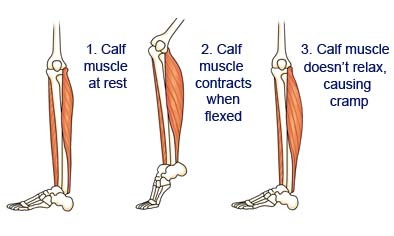 Cramps may affect any muscle, but are most common in the calves, thighs, feet, and hands. While painful, they are harmless, and in most cases, not related to any underlying disorder. Nonetheless, cramps and spasms can be manifestations of many neurological or muscular diseases. The terms cramp and spasm are often used interchangeably. They can be somewhat vague because they are sometimes used to also include types of abnormal muscle activity other than sudden painful contraction. These include stiffness at rest, slow muscle relaxation, and spontaneous contractions of a muscle at rest (fasciculation or clonism). Fasciculation is a type of painless muscle spasm, marked by rapid, uncoordinated contraction of many small muscle fibers that people often describe as a sort of “muscle fluttering.” For a physician, a critical part of diagnosis is to distinguish these different meanings and to allow the patient to describe the problem as precisely as possible. Normal voluntary muscle contraction begins when electrical signals are sent from the brain through the spinal cord along nerve cells called motor neurons. These include both the upper motor neurons within the brain and the lower motor neurons within the spinal cord and leading out to the muscle. At the muscle, chemicals released by the motor neuron stimulate the internal release of calcium ions from stores within the muscle cell. These calcium ions then interact with proteins within the muscle cell, causing chains of the proteins actin and myosin to slide past one another with a ratchet-like motion. This motion pulls their fixed ends closer, thereby shortening the cell and, ultimately, contracting the muscle itself. Recapture of calcium and unlinking of actin and myosin allows the muscle fiber to return to its resting length (i.e., relax). Abnormal contraction may be caused by abnormal activity at any stage in this process. Certain mechanisms within the brain and the rest of the central nervous system monitor the length of the muscles and help regulate contraction. Interruption of these mechanisms can cause spasm. Motor neurons that are overly sensitive may fire below their normal thresholds. The muscle membrane itself may be hypersensitive, causing contraction without stimulation. Calcium ions may not be recaptured quickly enough, causing prolonged contraction. Interruption of brain mechanisms and overly sensitive motor neurons may result from damage to the nerve pathways. Possible causes include stroke, multiple sclerosis, cerebral palsy, neurodegenerative diseases, trauma, spinal cord injury, and such nervous system poisons as strychnine, tetanus toxin, and certain insecticides. Nerve damage may lead to a prolonged or permanent muscle shortening called contracture. However, most muscle spasms are not caused by disease, but more commonly by physical activity or stress. Prolonged exercise. Relaxation of a muscle actually requires energy to be expended. The energy is used to recapture calcium and to unlink the actin and myosin. This causes the muscles fibers to lengthen because the unlinked chains slide back to their resting positions. Normally, sensations of pain and fatigue signal that it is time to slow down or stop. Resting allows the muscles to restore their supplies of energy. Ignoring or overriding those warning signals can lead to such severe energy depletion that the muscle cannot be relaxed, causing a cramp. For example, this is why long distance runners may cramp up after a run. The lack of blood flow deprives the muscles of their source of energizing oxygen and nutrients and removal of fatigue causing waste. Rigor mortis, the stiffness of a corpse within the first 24 hours after death, is also due to this phenomenon. Using a muscle inappropriately. Muscle cramps in such sports as golf or tennis are sometimes caused by an incorrect grip on the club or racket, or an incorrect swing. Anemia adversely effects blood flow to the muscles and can cause cramping and spasms. Dehydration and salt depletion. This may be brought on by protracted vomiting or diarrhea, or by copious sweating during prolonged exercise, especially in high temperatures. Loss of fluids and salts—especially sodium, potassium, magnesium, and calcium—can disrupt ion balances in both muscle and nerves. This can prevent them from responding and recovering normally, and can lead to a cramp. Metabolic disorders that affect the energy supply in muscle. These are inherited diseases in which particular muscle enzymes are deficient. They include deficiencies of myophosphorylase (McArdle’s disease), phosphorylase b kinase, phosphofructokinase, phosphoglycerate kinase, and lactate dehydrogenase. Myotonia. Myotonia is a condition that causes stiffness due to delayed relaxation of the muscle, but does not cause the spontaneous contraction usually associated with cramps. 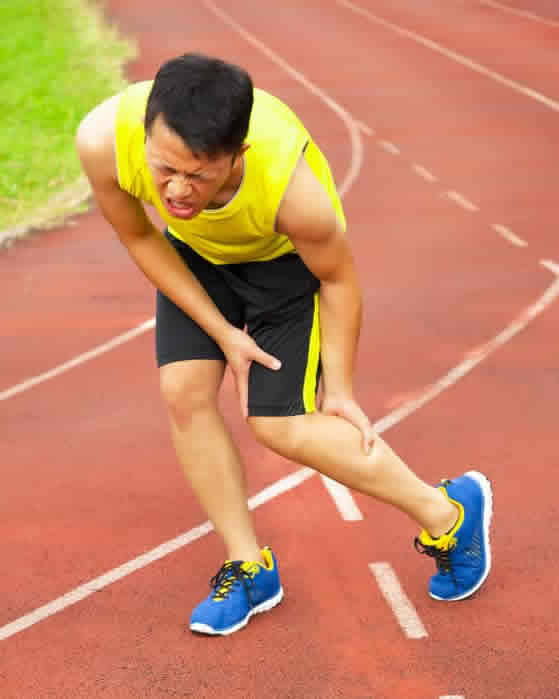 However, many patients with myotonia do experience cramping from exercise. Symptoms of myotonia are often worse in the cold. Myotonias include myotonic dystrophy, myotonia congenita, paramyotonia congenita, and neuromyotonia. Vascular disease, such as arteriosclerosis, Reynaud’s disease, and diabetic vasculopathy, decreases blood flow to muscles, which can cause cramping. Exposure to cold can also decrease blood flow, resulting in cramping and muscle spasms. Fasciculations may be due to fatigue, cold, medications, metabolic disorders, nerve damage, or neurodegenerative disease, including amyotrophic lateral sclerosis. Most people experience brief, mild fasciculations from time to time, usually in the calves. The pain of a muscle cramp is intense, localized, and often debilitating. Coming on quickly, it may last for minutes and fade gradually. Contractures develop more slowly, over days or weeks, and may be permanent if untreated. Fasciculations may occur at rest or after muscle contraction, and may last several minutes. Abnormal contractions are diagnosed through a careful medical history, physical and neurological examination, and electromyography of the affected muscles. Electromyography records electrical activity in the muscle during rest and movement. Most cases of simple cramps require no medical treatment. However, because cramps hurt, a person suffering a cramp will want to stop the cramp. An effective method for stopping a cramp involves contracting the muscle that causes the opposite action of the cramping muscle. This technique requires some training and knowledge of muscular anatomy, so it may be more effective if done by a therapist. Gently and gradually stretching and massaging the affected muscle may ease the pain and hasten recovery. A massage technique that can work is applying broad pressure on the cramping muscle. Applying ice can help if cramps persist. Fluid and salt replacement, by drinking water or properly prepared “sports drinks,” and/or eating fruits and salads bearing sodium, potassium, magnesium, and calcium (bananas are a good source) can also help. Cramps may be treated or prevented with gingko (Ginkgo biloba) or Japanese quince (Chaenomeles speciosa). Supplements of vitamin B12, folate, vitamin E, niacin, calcium, and magnesium may also help. Taken at bedtime, they may help to reduce the likelihood of night cramps. Guided imagery, relaxation, and meditation may all help lessen the pain associated with muscle cramps and spasms and may also dissipate the cramp or spasm. More prolonged or regular cramps may be treated with drugs such as carbamazepine, phenytoin, or quinine. Treatment of underlying metabolic or neurologic disease, where possible, may help relieve symptoms. Identified anemia can be treated with iron supplementation. The likelihood of developing cramps may be reduced by eating a healthy diet with appropriate levels of minerals, and getting regular exercise and adequate rest to build up energy reserves in muscle. Exercise should be accompanied by a proper stretching program. Avoiding exercising in extreme heat helps prevent heat cramps. Heat cramps can also be avoided by drinking ample amounts of water before prolonged exercise in hot weather. For intense activity over one hour, drinking fluid containing some sodium plus 4–8% carbohydrate in the form of sugars (glucose or sucrose) or starch (maltodextrin) is useful. Fluid temperature should be cool (45–55°F or 7.2–12.8°C). Taking a warm bath before bedtime may increase circulation to the legs and reduce the incidence of nighttime leg cramps.